Description: Spot the railcar over the unloading lift. Open the air valve to the lift. Open the gate on the rail car and begin unloading material through a sealed pathway from the railcar to the take away system. No one crawls under the car to connect a boot. Spillage and dusting are controlled. 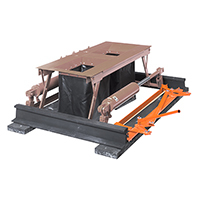 Hopper car lifts are available to mate with both single opening and double opening pocket cars. A custom sewn boot is attached to the inlet to the take away system which is usually a screw, belt, or pneumatic conveyor. As the lift raises, a foam seal compresses against the discharge gate to prevent escape of material as it flows from the car. Single opening hopper cars are the most common closed hopper cars. Railcars come with different gate openings. An adapter sheet is used to match the various size car openings. No tool are required to change out an adapter sheet which takes only seconds. One adapter sheet is needed for each different size car opening. Double opening hopper cars are common in the cement industry. Gate openings on most double opening cars measure 13" x 24." The operator pauses the lift when raised halfway to manually spread the dual seal assemblies and match the spacing of the dual openings on the hopper car. The operator performs this step from along side the car and does not have to crawl under the car. Once the seal assemblies are spread, the operator fully raises the lift with the air valve and seals against the gates. Optional air or manual aligners allows adjustment of approximately 2-1/2" either side of center for easier car spotting. Gate Openers help prevent worker injuries when manually opening or closing gates. 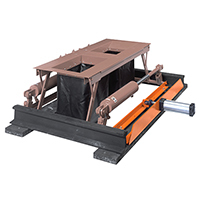 Rail car vibrators assist gravity discharge of materials from hopper cars.